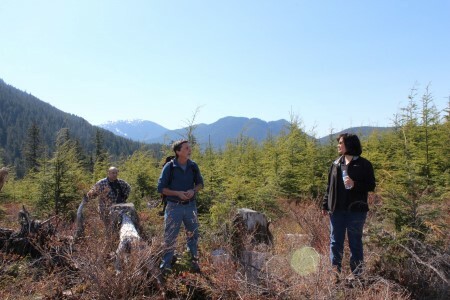 During a field tour of Heen Latinee Experimental Forest, Alaska, attendees learned about ongoing research on yellow-cedar. Judy Mason, USDA Forest Serivce Snapshot : Genetic analysis shows that yellow-cedar is a diverse and highly mobile species. Yellow-cedar (Callitropsis nootkatensis) in Alaska are suffering from a decline induced by climate change, and a lack of genetic information limits deliberate gene conservation efforts to mitigate declines in population fitness. Improvements in DNA sequencing technology have made it possible to develop genetic markers inexpensively, and these are being applied to yellow-cedar management in Alaska. A survey of 129 Alaska yellow-cedar populations show that the newly developed genetic markers are exceptionally variable and have the power to discriminate millions of genetically distinct individuals. Genetic analysis shows that yellow-cedar is a diverse and highly mobile species. Recent population growth in Alaska has eliminated evidence of spatial genetic structure at many levels (molecular; quantitative traits). These results point to a limited potential for finding genetic solutions for cedar decline within Alaska and point to greater potential for identifying climate tolerance in geographically distant sources.